Should You Delete Negative Comments? Content on this blog is meant to be a learning experience for readers and brands alike. The post today was written by Barrett Crites who was originally involved in the Facebook conversation with Fair Oaks Farms. Remember… real change happens in extreme circumstances. Learn from the Red Cross. It is important to take a breathe and move on… but learn. Social Media branding is a fickle mistress who sleeps with a gun under her pillow. When staring down the barrel of a negative comment, brands have to choose whether to embrace or delete. One of these choices often comes with a bullet. The other usually does not. This is a topic that continues to plague brands on a daily basis. It seems so cut and dry on the surface, but our intrinsic nature as humans drives us to protect ourselves at all costs. And sometimes this knee-jerk, misguided act of protectionism leads to more harm than good. A recent example involves Indiana’s Fair Oaks Farms. 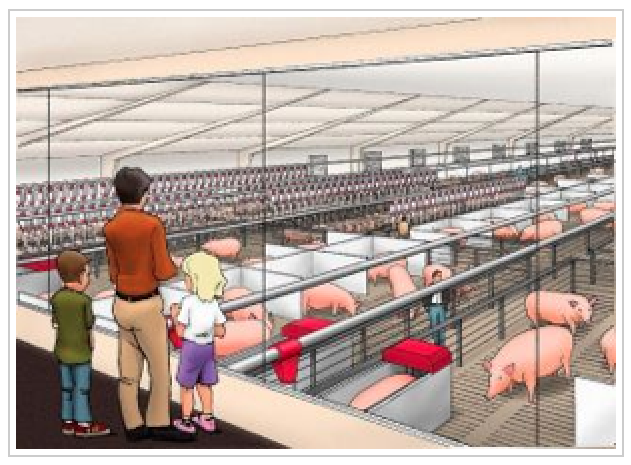 The farm posted a well-intentioned artist rendering of a new swine facility dubbed “Fair Oaks Farm Pig Adventure”. The image shows a family looking out over an idyllic pig enclosure. Shortly after the picture was posted, several proponents of humane/sustainable farming began to thoughtfully comment on the apparent factory-farmed conditions being depicted. Within minutes several voices in defense of Fair Oaks Farms joined in, and a full-fledged, constructive and cordial debate began. That is until Fair Oaks Farms chose to start deleting comments from the sustainable camp while liking and praising the comments that favored the farm. This was a missed opportunity on several levels. An opportunity to educate the nay-sayers on how the farm plans to raise the pigs. An opportunity to let the farm’s loyal fans rally to their defense (which they were doing quite well). An opportunity to show the farm truly believes their “we have nothing to hide” philosophy. But the opportunity was missed, and the people who were silenced quickly took their voices to the digital streets known as Facebook timelines and Twitter feeds where thousands of their friends and followers learned of the situation and began to rally. If Fair Oaks Farm had chosen to be patient and allow for the conversation to play out, the attention on the issue would have been quietly contained to the five or six people who were initially involved. This small group would have grown weary and quickly moved on; feeling satisfied by the debate on the Fair Oaks Farms Facebook page. But deleting comments and blocking users is like gas to a fire. And fire spreads. Within minutes, a Facebook post about the farm’s deletion practices had already racked-up 50 comments. Conversations about your brand will take place with or without you. If given a choice, choose to be part of the conversation instead of negatively driving it to a forum you have no access to. Stay calm and assess the situation before reacting. Then engage in a meaningful way. This method can convert customers, and stands a much better chance of blowing over. 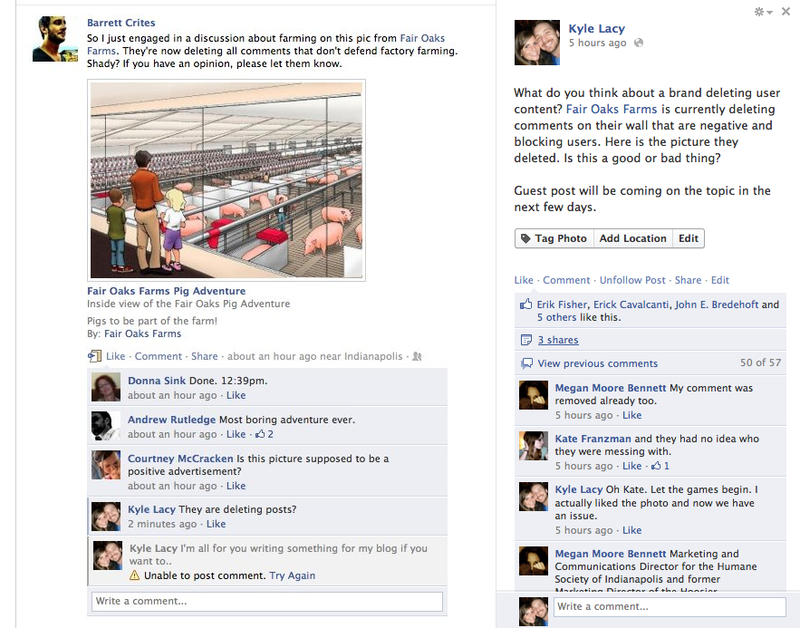 Update on February 20th 2012 – Fair Oaks Farms did release a FAcebook policy on their wall. 1) No advertising of your product, venue or any other type of advertising. 2) No cursing of any type, we are a family destination. 3) No name calling, no matter how benign. If you can’t make your point without calling someone a name, then maybe you need to rethink your point. 4) Derogatory or inflammatory arguments will not be allowed. This is the Fair Oaks Farms Facebook page and if you have an axe to grind please do it somewhere else. Fair Oaks Farms Facebook page is an honor-system agreement between you and Fair Oaks Farms. If any of these trusts are broken, you will be removed from Fair Oaks Farms Facebook page and will not be allowed to become a fan again. Thanks for being a fan of Fair Oaks Farms and happy commenting! The Fair Oaks Farms Facebook team. So, the next time your brand is staring down the barrel of a negative comment, will you take a bullet or embrace the opportunity it brings? Barrett is a 12-year veteran of the marketing game, currently serving as an Account Director at Indianapolis-based ad agency. When he’s not busy slinging ad concepts, he can be found blogging about Mid Century Modern design over at Atomic Indy. As a rule of thumb, you should never delete comments. Obviously, this stinks, because you end up hosting negative opinions about your brand. If people want to be mean, it's tempting to insist that they do it on their own websites and not yours. One excellent technique is to minimize the appearance of comments. Most blogs place comments at the end. The Indianapolis Star puts the on a second page. This reminds readers that the comments are separate from your content, and that you do not attempt to police them. In general, you can't control what people say—you can just create the space where the conversation happens. Great post. Last year I advised a friend on handling a series of negative face book business page comments (B2C – all from one person who had acquired their product second hand). Not understanding the potential negative impact, the Exec staff wanted to delete the comments. We outlined the possible repercussions and a plan of action, which when implemented did lead to a positive outcome. I believe the most important lesson is – Don't wait until it happens have a plan in place before it does. The only way I think it is acceptable to delete tweets would be if there has been a 1-1 conversation between the brand the user discussing the issue and the user has agreed to delete it. No you shouldn't. The biggest reason being, as the post states, people will notice. It makes you look unable to handle criticism. Negative comments can actually benefit you by giving you an opportunity to have a discussion. Maybe you can defend your brand or at least be open to suggestions on improvement. The only reason to delete comments would be if they are inappropriate or profane. Little makes me lose respect for a person/business faster than deleting comments. I've been writing professionally for decades now and I really value any feedback my potential audience is willing to provide. They are motivated enough to talk to me, the least I can do is listen….and learn what I can. My first personal email from a reader started, "You're just like Stalin!" because I had "disappeared" (meaning not covered) a product that was released after we went to press. Ignoring his approach, I dropped him email and teased out what was special about this thing he liked. When it came time to write a second edition, his suggestions were integrated, improving the overall quality of the book. Had I ignored him because I didn't like his approach, MY product would have suffered. PS – Fair Oak Farms is on my boycott list. In general you shouldn't delete parts of a conversation unless you are redacting them for reasons of national security. Fair Oaks engaged in the use of social channels without fully understanding the ramifications, and had not intelligently integrated social into their overall business strategy. Their current Facebook Page Rules of Engagement still falls short. Imagine if Fair Oaks entered into the social realm with their act together, ready to seize the opportunity. Can we compare a photo of the piggie tunnel with the illustration? As a brand, I know what it's like when customers or prospective customers post discussions that you'd rather have take place in private. Still, that doesn't mean that you should be deleting those discussions. It's one thing to delete downright rude language, and another to try and sweep the issue under the carpet. The latter is messy and doesn't really resolve anything. In social networks the number one rule is never delete negative comments, instead handle them very well. If they are mad explain as much as possible and see if what they say is as reasonable as possible. In business especially online we can't avoid complains, because people have different standards on products and services. Answer their negative comments well and let the readers judge. Since if you are reasonable and ethical on your part you should not be worried on negative statements. cause a disturbance on the page with the intention of causing hell. fool who could insult me or my business – hell no ! Lastly, people will always find fault with other people – regardless … you can’t please everyone equally and all the time… there will be a 1 or 4 % that just feel the need to be idiotic about you or your business – might not be on facebook – but anywhere… just be content with those that you can please !